According to Angela Montenegro, “the whole point of the week is the weekend.” And don’t worry, because it’s almost here! ABCey presents the Weekend Line-up, the five events we are most excited for this weekend! 1. Dew Tour |Friday October, 11th – Sunday, October 13th | 1:00 p.m. – 7:30 p.m. | Civic Center | The Dew Tour is back! Come watch some of the greatest young athletes of the day duke it out in a three day Skateboarding, BMX (biking), and FMX (motocross) contest. The event is free, and the action is endless. 2. Urban Air Market | Saturday, October 12th | 11 a.m. – 6 p.m. | Haight and Fillmore | Enjoy the last couple days of Indian Summer with over 130 indie designers and live music all day long. It’s a celebration of art, music, sustainable design, and community. We will definitely be there, so hopefully you will too! 4. 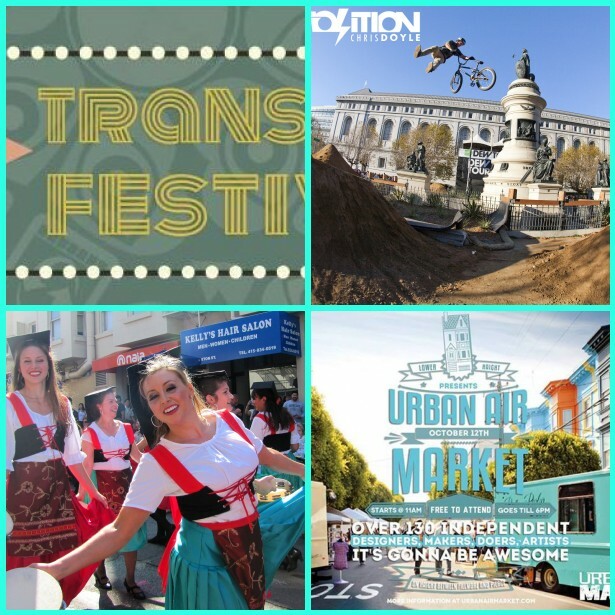 Transbay Fest | Saturday, October 12th| 6:30 p.m. – 11:30 p.m. | Dimenson 7 Studios | It’s a interactive expo with tech talks, in celebration of film, video, apps, games, and augmented reality. Listen to interesting lectures from some big tech gurus, and with two major performance sessions. Make sure to RSVP to secure your ticket. The event is free, but a donation from $5-$20 is suggested. 5. Italian Heritage Parade | Sunday, October 13th | 12:30 pm. | Fisherman’s Wharf to Washington Square | This is the cities oldest celebration of heritage, and the United State’s longest running Italian-American parade. It begins at 12:30 at Jefferson and Stockton in the Wharf and ends in Washington Square. Here, there will be a Ferrari car show, and activities for both kids and adults. Got any fun weekend plans? Let us know in the comments, or on Facebook and Twitter!